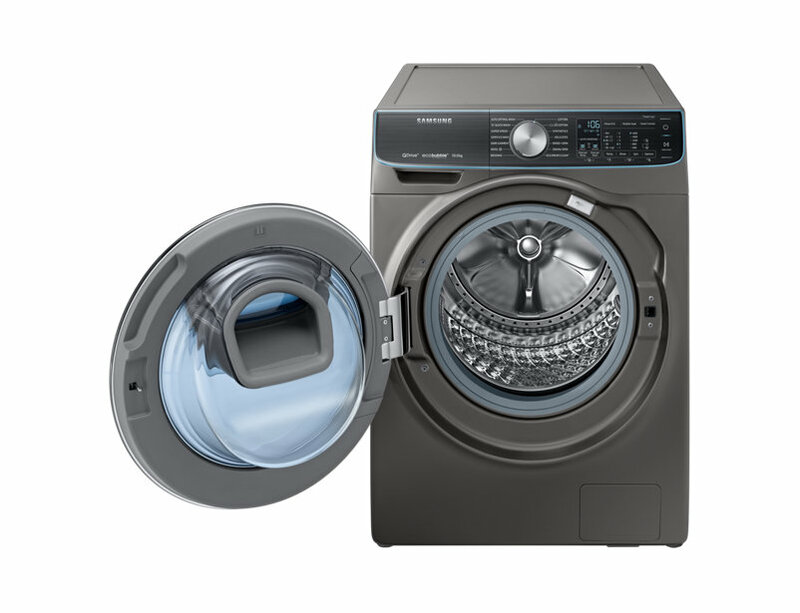 Innovative QuickDrive™ technology reduces the washing time by up to 50%*, without compromising the cleaning performance. Samsung’s unique fabric care drum is equipped with a pulsator that creates a fast water flow that covers the entire drum. As a result, the detergent penetrates deep into the fabric, to give your clothes a thorough wash in less time*. Unique cool wash technology for even greater energy savings. The efficient ecobubble™ technology mixes air, water and detergent to create bubbles that penetrate your clothes faster, helping you wash at cooler temperatures. Better for the environment and your bills. 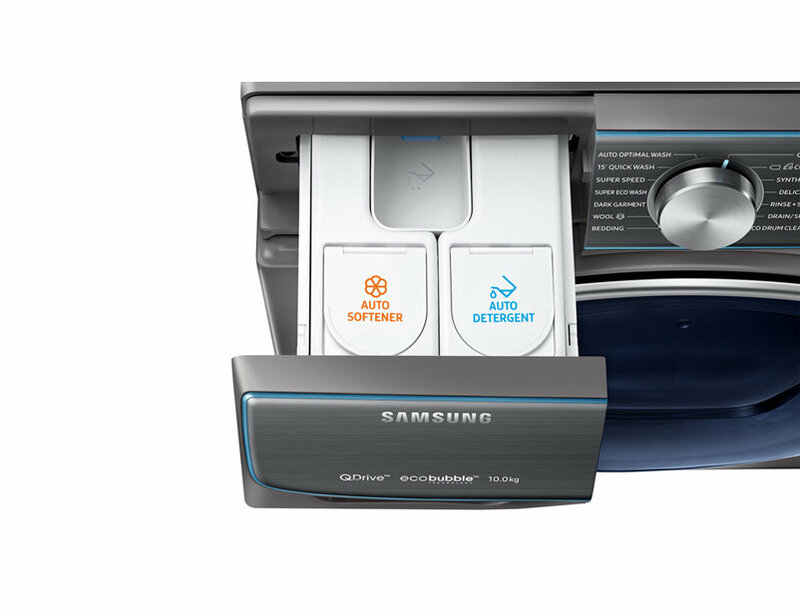 The Auto Optimal Wash feature uses 4 sensors to optimise washing results without any extra effort. 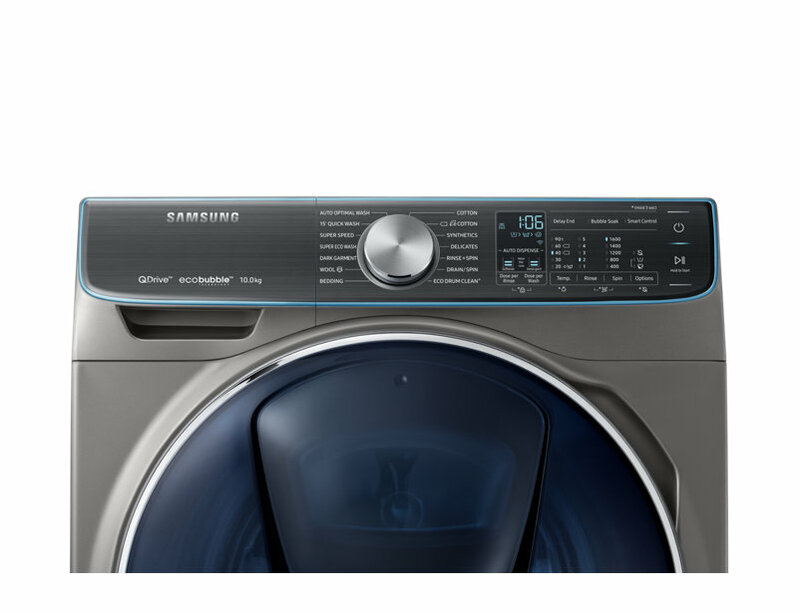 It senses the weight of the wash load and adjusts the optimal time and water usage for the best possible wash. 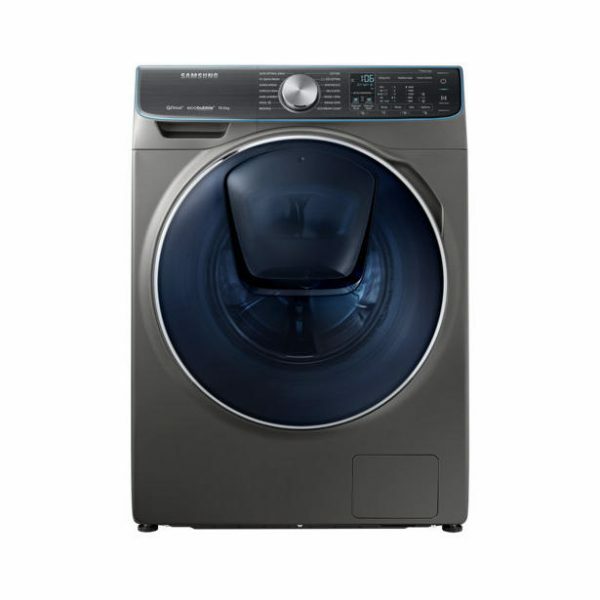 It assesses the level of soil and adds more detergent towards the end of the wash cycle, if necessary, and adjusts the wash time accordingly. The modular design allows you to simply detach the liquid containers, making it easy to refill and wipe clean any residues. *Requires ‘Samsung Connect’, available on Android and iOS. Registration required. *Requires’ Samsung Connect’, available on Android and iOS. Registration required. The quiet Digital Inverter Motor gives you long-lasting, reliable performance. Less noise, less vibration and less wear and tear – it even has a 11 year warranty*. Now everyone can enjoy a more peaceful wash thanks to our VRT M technology and a drum that keeps in perfect balance, even at high spin speeds. The Anti-Scale Heater minimises the energy used when heating the water during the wash cycle. The new type of coating is made of an anti-adhesion material that reduces the build-up of limescale around the heater, and avoids unnecessary energy consumption. No more socks left behind! This washing machine includes an internal drum light that lets you see exactly what’s inside – and make sure that you get everything out. Located on the upper right side inside, it brightly illuminates your laundry and the rest of the drum, so you can quickly and safely check the contents. Samsung is a world-renowned brand, recognised as one of the global market leaders by industry authorities. Samsung kitchen appliances are beautifully designed, more efficient and deliver best-in-class solutions for your kitchen through innovation, design and efficiency.